Photon PV O&M system is designed to solve the pain points of most large scale PV operation. As growth of PV plants, operators will see a huge drawback of system performance as data growth, especially their PV plants are distributed in different geo locations. As a result, the latency will become very slow and data lost significantly impacts efficiency of operation. Our PV O&M system fundamentally solves these issues by an intelligent data management system. It will allow andpresent same performance in any size or distributed PV operations. Photon’s AI engine is specialized to learn from data, historical and real time, to predict PV energy output with 95% accuracy for next 5 mins. PV operators can have better planning for energy exchange and risk management with such capability. 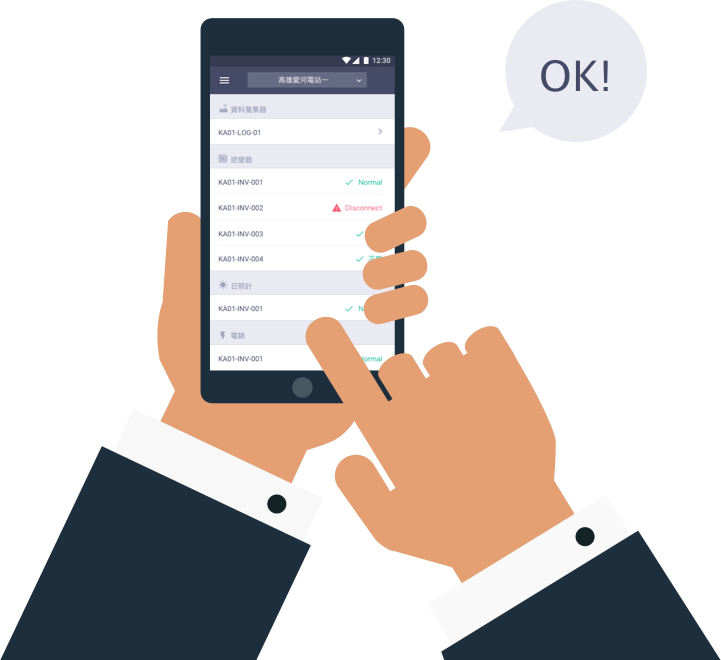 Push notification to mobile devices with ticket infomation. The maintenance report is also filled up from mobile phone. Qulick and easy. Data backed visualization improve decision making and shorten response time. An experienced service manager can locate the problem within a few seconds through our system. Inexperienced starters also can perform the same as how other team members do when they are trying to look for solutions. Once connectivity is ready, the data logger will automatically synchronize with Photon server.